In my experiment, my group increased the temperature of a fish's water. We noticed the fish took more breaths than the prior normal temperature. Is this because the fish is trying to breathe in the water's oxygen, which is evaporating more quickly than in normal temperature? 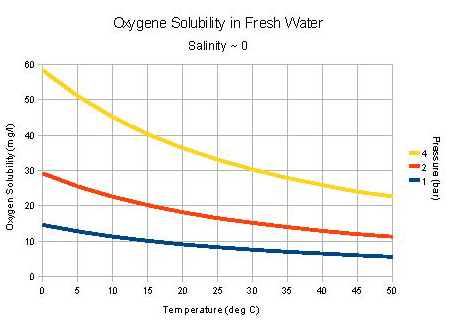 As you can see on the diagram below, oxygen solubulity in water drops by increasing temperature, so your fish has to breath more to get the same amount of oxygen. You can find more info about why gas solubility is temperature dependent here: Chemistry (Averill & Eldredge) / Effects of Temperature and Pressure on Solubility. Standard Metabolic Rate (SMR) is the metabolic benchmark in fish. It is the metabolic rate of a resting fish at a specified temperature in the middle of its normal range. Therefore a trout's SMR15 would be the resting metabolic rate of a trout at 15'C. There is natural law called Q10 = 2: chemical reactions tend to double with every 10'C increase in temperature of the reactants. In poikilotherms, this is translated into biochemical events and in turn into metabolism. The metabolic rates of fish roughly double with every 10'C increase in temperature, except at the extreme ends of their temperature tolerance. The fish become stressed and their physiological rate increases. for example, a fish at 5 degrees, his stomach can take 2 weeks to digest a meal, and at 25 degrees it takes 2 days. Not the answer you're looking for? Browse other questions tagged respiration breathing temperature or ask your own question. Why does temperature shock kill fish? If people can survive being frozen some, why not indefinitely? Why does solute potential go up as temperatures go down?